The (¿;D) (degree/diameter) problem consists of nding the largest possible number of vertices n among all the graphs with maximum degree ¿ and diameter D. We consider the (¿;D) problem for maximal planar bipartite graphs, that are simple planar graphs in which every face is a quadrangle. We obtain that for the (¿; 2) problem, the number of vertices is n = ¿+2; and for the (¿; 3) problem, n = 3¿¿1 if ¿ is odd and n = 3¿ ¿ 2 if ¿ is even. Then, we study the general case (¿;D) and obtain that an upper bound on n is approximately 3(2D + 1)(¿ ¿ 2)¿D=2¿ and another one is C(¿ ¿ 2)¿D=2¿ if ¿ D and C is a sufficiently large constant. Our upper bound improve for our kind of graphs the one given by Fellows, Hell and Seyffarth for general planar graphs. We also give a lower bound on n for maximal planar bipartite graphs, which is approximately (¿ ¿ 2)k if D = 2k, and 3(¿ ¿ 3)k if D = 2k + 1, for ¿ and D sufficiently large in both cases. The (¿;D) (degree/diameter) problem consists of nding the largest possible number of vertices n among all the graphs with maximum degree ¿ and diameter D. We consider the (¿;D) problem for maximal planar bipartite graphs, that are simple planar graphs in which every face is a quadrangle. We obtain that for the (¿; 2) problem, the number of vertices is n = ¿+2; and for the (¿; 3) problem, n = 3¿¿1 if ¿ is odd and n = 3¿ ¿ 2 if ¿ is even. Then, we study the general case (¿;D) and obtain that an upper bound on n is approximately 3(2D + 1)(¿ ¿ 2)¿D=2¿ and another one is C(¿ ¿ 2)¿D=2¿ if ¿ D and C is a sufficiently large constant. Our upper bound improve for our kind of graphs the one given by Fellows, Hell and Seyffarth for general planar graphs. We also give a lower bound on n for maximal planar bipartite graphs, which is approximately (¿ ¿ 2)k if D = 2k, and 3(¿ ¿ 3)k if D = 2k + 1, for ¿ and D sufficiently large in both cases. Dalfo, C.; Huemer, C.; Salas, J. 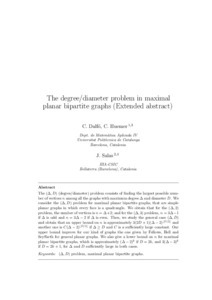 The degree/diameter problem in maximal planar bipartite graphs. "Electronic notes in discrete mathematics", 2014, vol. 46, p. 73-80.